This is a 20 year old male with a renal tumor. Histologic Description: This is a difficult to classify oncocytic neoplasm. 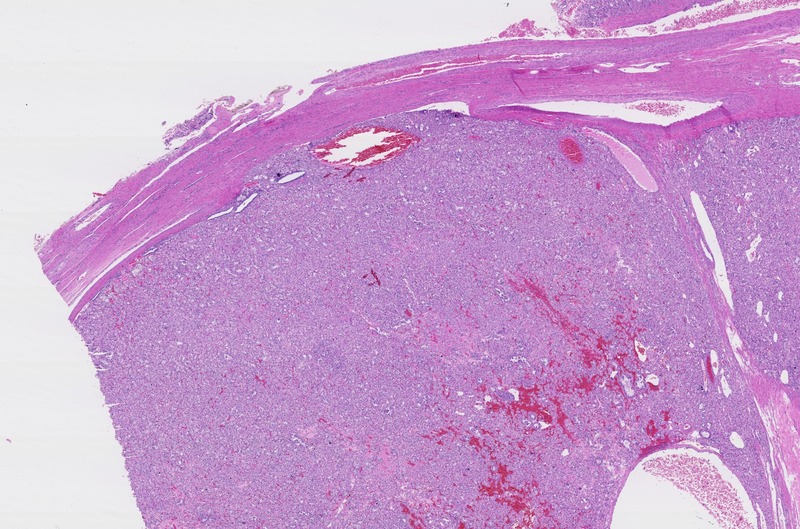 There are focal areas of calcification suggestive of the MiT family translocation carcinoma. Well-developed cell vacuolization is not present, and neither are cytoplasmic inclusions. 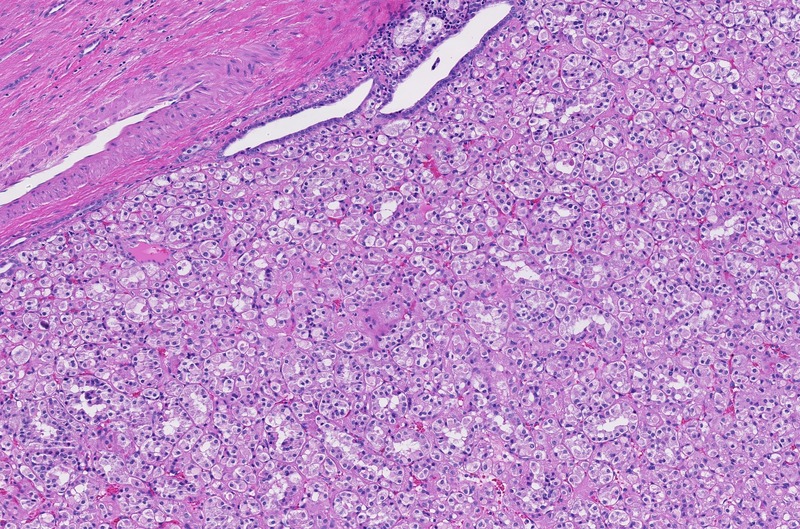 By immunohistochemistry, this neoplasm demonstrates loss of SDHB, supporting the diagnosis of SDH-deficient RCC. Fumarate hydratase immunostaining was intact, and no evidence of TFE3 rearrangement was identified by break-apart FISH. Differential Diagnosis: Oncocytoma would have a more nested pattern, edematous stroma, and round nuclei throughout. Xp11 translocation RCC would almost always demonstrate rearrangement of TFE3 by FISH. 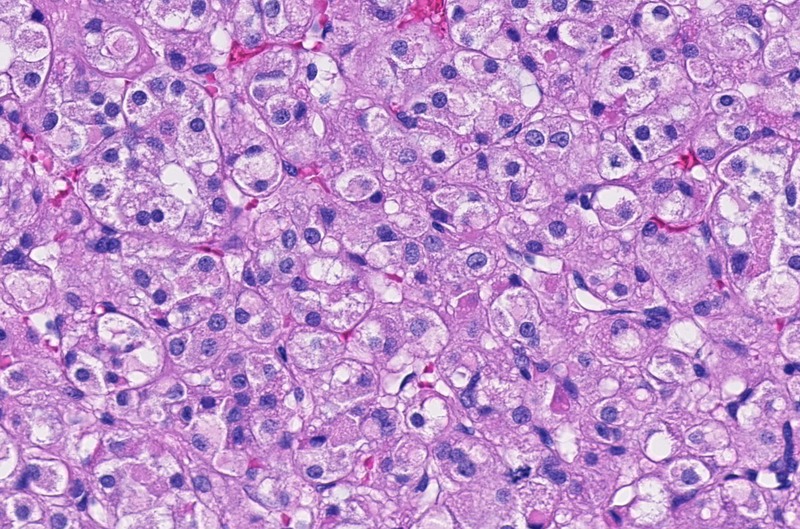 Fumarate hydratase deficient RCC shows loss of fumarate hydratase protein by immunohistochemistry, and typically shows more prominent nucleoli. This case illustrates the phenomenon which we have recently reported; specifically, that SDH-deficient RCC in young patients frequently do not demonstrate the characteristic morphologic features that have been described such as cytoplasmic vacuolization and inclusions. We have a low threshold for ordering SDHB and fumarate hydratase immunostains in this setting (Li Y et al. Histopathology 2018; 72:588-60).